The proper touch on your piano depends on it being regulated. To many pianists, a piano’s touch is as important as its tone. Touch refers to the efficiency and responsiveness of the mechanical action of the piano, and is what is responsible for giving a piano its full range of power from the silkiest of pianissimos to a crashing double forte. When a piano begins to lose its mechanical efficiency, it is said to have gone out of regulation. Exacting measurements and corresponding adjustments are needed to put a piano back into regulation. The adjustments of your piano action related to touch have not been attended to recently and are causing the piano to be less than responsive. A job of regulation is in order. To a greater or lesser degree your piano would have been regulated at the factory where it was built. Fine quality instruments obviously receive more attention than models on the low end of the price spectrum, and as such have a better touch from the beginning, but even the finest quality piano will go out of regulation over time. To understand the complexity of the vertical piano action and the primary cause of an action going out of regulation, consider the cutaway photo of the action from an actual piano on the next page. The action of the vertical piano is truly a mechanical marvel. Perfected before the turn of the last century, its remarkable design is still in use today. Although the operation of the piano may seem simple from the outside, inside it is in fact very complex. When a note on your piano is played, the energy from your finger instantly puts a carefully balanced system of levers and springs into motion. 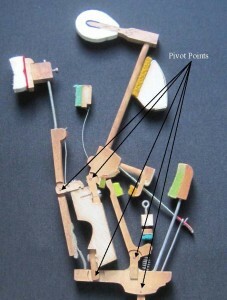 Eight pivot points (five shown) swing the combination of parts into action. Felt cushions at all contact points prevent action noise from intruding upon the music produced. When properly adjusted, the vertical piano action is capable of a level of performance second only to a fine quality grand piano. For most musicians, it will provide everything it’s asked to give musically and more. 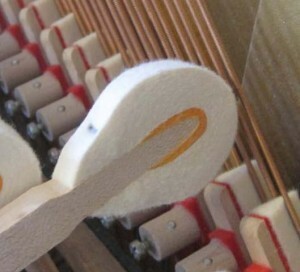 The primary reason that the action of a piano goes out of regulation is that the felt parts (over two dozen per note) which are so important to the functioning of the action become worn and compressed with age and use. 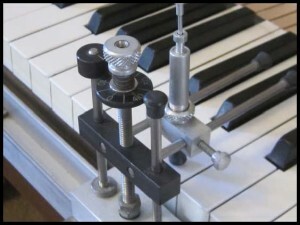 As compression occurs, adjustments to the contact points which were made when the piano was new no longer are accurate. As this happens, a gradual loss of performance occurs. Lost motion in the action prevents maximum power from being transmitted from the keys to the strings when forte is called for. Early release of the hammers causes misfiring notes when subtle pianissimos are attempted. Doublestriking notes become more and more of an annoyance. Although the change occurs over time, at some point it starts to become obvious that the piano is not performing up to par. Could I have a description in detail of how one particular regulation adjustment is made? Once the measurement has been made for the key, leveling papers are added at the balance rail to bring the height of the key up to level. Papers as thin as .001″ are used to produce a perfectly level set of keys. After all the keys have been leveled, the leveling papers and the balance rail felts will be flipped so that the felts are on top. What other adjustments will be made? In addition to leveling the keys, a minimum job of regulation will include setting the hammer blow, taking up the lost motion, adjusting the hammer letoff, setting the key dip, and checking the amount of aftertouch. How extensive of a job is it to regulate a piano? The good news is that the work is done primarily onsite. The action may need to be taken to the shop beforehand for related repair work, but the actual job of regulation is done at the piano. The work is extensive in the sense that every adjustment needs to be made for every note on the piano. Additionally, many times a second pass through is necessary because of the fact that the adjustments are interrelated and affect one another. Also, be advised that the longer it has been since the piano was previously regulated, the more time will be required. Are there ways to tell if a piano is out of regulation without precise measurements that only a technician can perform? Certainly. One of the easiest symptoms to spot are keys that are no longer level. Get down on eye level with the white keys, and look to see if the keys are perfectly even from one side to the other. You can also use a lightweight straightedge to check the level of the keys. Place it edgewise along the white keys and see if daylight shows between any of the keys and the bottom of the straightedge. A second, easytospot symptom of an action which is poorly regulated are hammers which are letting off too early. 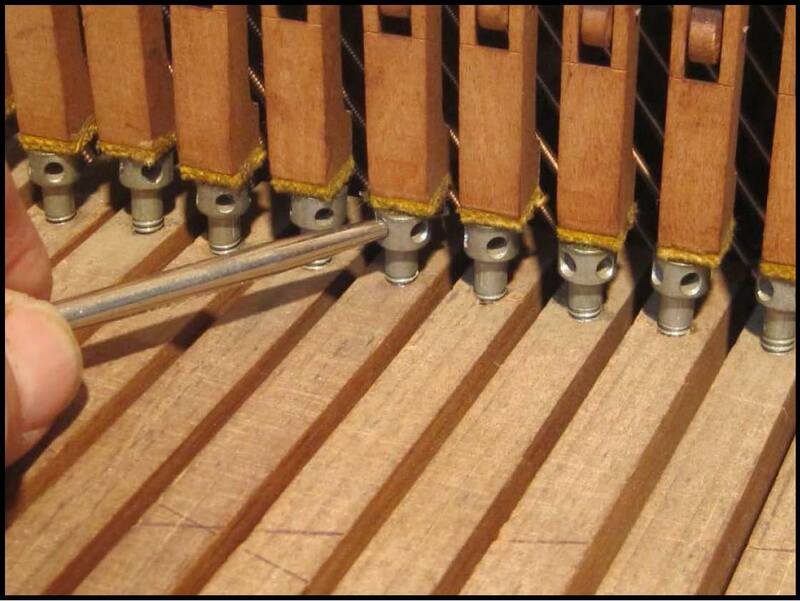 Lift the lid of your piano, and check to see how close the hammers come to the strings before being let off. To do this, push very slowly on a key while watching the hammer approach the strings. When a piano is well regulated, the hammer will come close to the strings before being tripped. 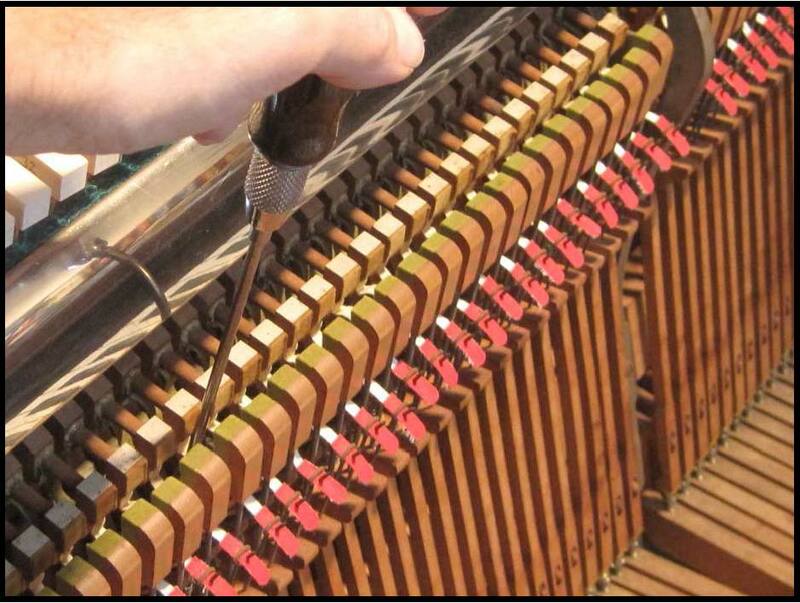 If the release is occurring much more than 1/8″ away from the strings, the piano’s letoff is in need of adjustment. When these two specific adjustments are incorrect, it is part of a larger picture of a piano action which needs attention. For most pianos, a regulation every 5 10 years should be adequate. Since a piano goes out of regulation as a result of the amount of play, a piano which is used on a more regular basis will need to be regulated more often than one that sits idle for long periods at a time. If other repairs are needed, is there a logical order in which to do them? Yes. 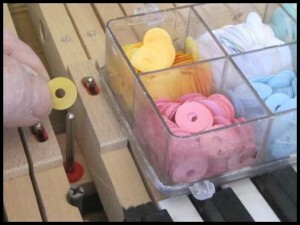 If new keytops are to be installed, or if hammers are to be filed or replaced, regulation of the action should wait until those repairs are completed to avoid having to repeat making the same adjustments. If an overhaul of the piano is in the works, on the other hand, this is the ideal time to regulate the piano. It will put the finishing touch on all the other repair work done on the piano to bring it up to its potential. With any needed repair work to your piano action accomplished and the regulation of the action done to perfection, your piano will be more responsive and fun to play than it has been in a long time. Capstans are adjusted to take up lost motion.